The Cavalier King Charles Spaniel descends from the King Charles Spaniel, which was named after Charles I of England! The King Charles Spaniel was named after Charles I of England, but it was King Charles the second that so loved this breed that he decreed it could not be denied access to any public place. Over the years, this breed underwent some changes. It became smaller with a domed head and a shortening of the muzzle. Today it is known as the English Toy Spaniel. However, there were numerous paintings, depicting Charles II with his dogs, that showed the originating breed to be flat skulled with a pointed snout and slender limbs. In the 1920's breeders began to selectively breed for these traits, and the result was the Cavalier King Charles Spaniel. A large toy dog breed, the Cavalier King Charles Spaniel is a spunky and pleasant companion. It is an active and outgoing dog that is quite intelligent, and tends to be very well behaved. It thrives on affection from its family and loves to participate in outdoor activities. Though it may chase small pets and wild animals, it does well with children who know how to treat it and gets along with other dogs and cats. When selecting a Cavalier, there are several potential health problems that it is important to be aware of. One that eventually occurs with most dogs of the breed is mitral valve disease. This is a condition that can lead to heart failure. Syringomyelia, a condition of the brain and spine, is also quite common. Other common problems include hip dysplasia, episodic falling, blood disorders, luxating patella, and eye and ear problems. Cavalier King Charles Spaniels: Almost Extinct!? Breed Type A large toy breed, the Cavalier King Charles Spaniel is a spunky and pleasant companion. The breed is best suited to cool to moderate climates. Background The Cavalier King Charles Spaniel is a descendent of the King Charles Spaniel, which was named after Charles I of England. He loved the breed so much that he passed a decree that it could not be denied entry into any public place in the country. 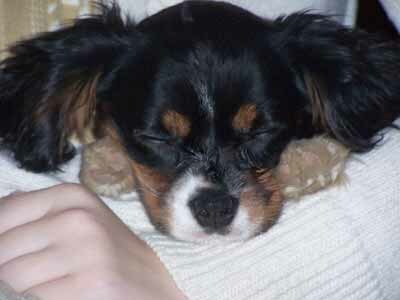 The King Charles Spaniel had a long snout and slender limbs. The King Charles Spaniel was later bred with Asian dogs, including the Pug and the Japanese Chin. But in the 1920s, American breed enthusiast Roswell Eldridge offered a monetary award to exhibitors of King Charles Spaniels with longer noses, flat skulls, and lozenges on the crown that resembled those in paintings of King Charles II and his dogs. Breeders began to selectively breed for these traits, and the result was the Cavalier King Charles Spaniel. Description The Cavalier King Charles Spaniel is a small dog with large, dark eyes and long, feathered ears. Its muzzle is cone-shaped, with a wide nose. The coat is fairly long, silky, and sometimes wavy. Colors include ruby, black and tan, tri-color and blenheim (chestnut and white). Some blenheims have a chestnut-red spot on the crown. Adults of both sexes measure 12 to 13 inches and weigh 10 to 18 pounds. Care and Feeding Cavalier King Charles Spaniels do well on a diet that includes poultry, lamb, wheat, oats and potato. The Cavalier's beautiful coat needs frequent grooming, including combing or brushing and baths or dry shampoos as needed. The pads of the feet will need regular trimming. Eyes and ears should be kept clean and checked regularly for signs of infection. Its tail may be docked, but this is not common. Cavaliers shed moderately. Regular vacuuming is necessary if this breed is to be kept indoors. Housing Your Dog The Cavalier King Charles Spaniel may live indoors in small spaces, but it needs at least a small yard to run and play in. Social Behaviors The Cavalier may be shy around strangers, but is rarely aggressive. This breed does well with children who know how to treat it, and usually gets along quite well with other pets of any kind. They may, however, chase small pets and wild animals. Handling and Training Cavalier King Charles Spaniels are easy to communicate with, and that usually translates into ease of training. They excel at obedience. Activities Cavaliers love to play, and this can take care of a great deal of their exercise needs. But they still need to be walked each day. They are best suited for cool to moderate climates. Breeding/Reproduction Due to the prevalence of health problems, it is crucial to be as responsible as possible when breeding Cavalier King Charles Spaniels. When selecting a mate, check bloodlines carefully for early onset of mitral valve disease, syringomyelia, blood disorders, joint problems, eye problems, and deafness. Common Health Problems The seriousness of the health problems in this breed often necessitates lots of expensive testing, so it is important to be prepared for that. Eye and ear infections are common, but can often be prevented with proper care. The incidence and severity of joint problems can be decreased by carefully watching the dog's weight. Availability Cavalier King Charles Spaniels are available in most areas. Prices are often in excess of $1,000. Hi, I reckon the King Charles Spaniels are the best dogs ever! see ya! You could try crate training him, as they won't soil their crate because that's where they sleep. It can help teach them control. home as we are going on 7 and 8 yrs. old.